UnitedHealth Group (NYSE: UNH) has posted strong results in recent years. The company saw its revenue grow by 9% in 2017, driven by growth in the UnitedHealthcare and Optum segments. Medicare’s 40% contribution, the highest, to total UnitedHealthcare revenue was primarily driven by strong Medicare Advantage performance. In the Optum business, OptumHealth saw the biggest jump, which was driven by a 9.6% increase in the number of customers that resulted from growth in care delivery, consumer health engagement services, and health financial services. Also, robust cost management and comparatively lower taxes boosted the company’s EPS in 2017. More often than not, the company’s results have exceeded expectations, which has contributed to the rally in the stock price. The company’s stock grew by 38% in 2017 and has been hovering around $230 currently, but is that price sustainable? Our valuation dashboard suggests that the current market price may still be cheap. Below we discuss how we estimate UnitedHealth’s valuation. Detailed steps to arrive at our price estimate and the revenue calculations are outlined in our interactive dashboard, and you can modify our assumptions to arrive at your own price estimate for the company. 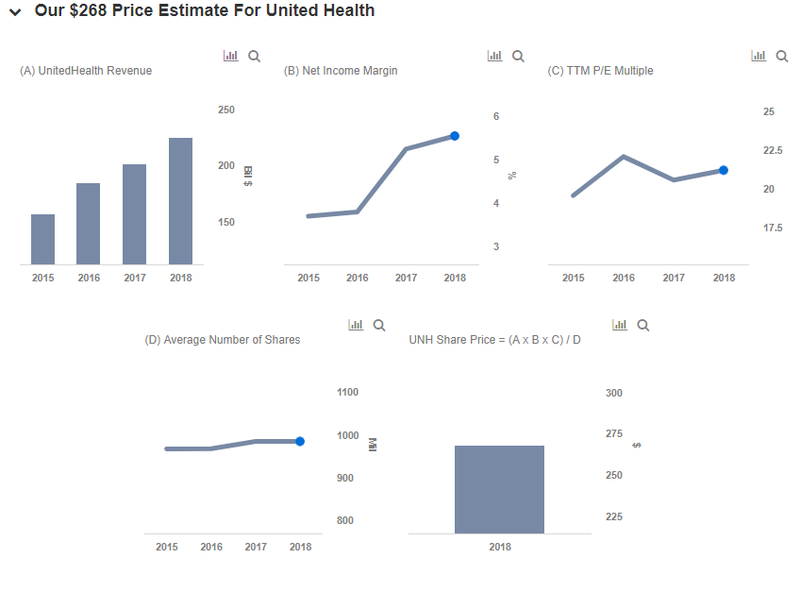 We have a price estimate of $268 for UnitedHealth Group, which is ahead of the current market price. This is based on a revenue forecast of $224 billion. The company will continue to benefit from its complementary business segments which help in providing a convenient customer experience. With the population of Medicare beneficiaries slated to grow in the coming years, we expect strong growth in UnitedHealthcare’s Medicare & Retirement business. In the Optum business, OptumCare is likely to see continued strong growth. This will be driven by increased use of data analytics that should also help the business to penetrate into different markets. Further, the acquisition of DaVita Medical Group should help OptumCare expand its portfolio and unlock further value. Furthermore, we expect UnitedHealth’s net margin to slightly improve in the near term due to robust cost management efforts and lower tax rates. We forecast net income of about $12.5 billion, or EPS of over $12. Finally, using our estimated P/E multiple of 21 gives us $268 as a fair price estimate.